Since our stakeholders, both internally and externally, are of great importance to us, regular communication with our stakeholders gives us the opportunity to be an inclusive Bank. The feedback from our stakeholders allows us to determine risk and opportunity areas more comprehensively as well as understand stakeholder expectations and meet their needs more sensitively. In addition to maintaining the dialogue with our stakeholders through various channels all year round we used the AA1000SE Stakeholder Engagement Standard as a reference to conduct the stakeholder engagement process in a more strategic and comprehensive way. With a 22% response rate we collected the opinion of 152 people through an analysis carried out by an independent company. 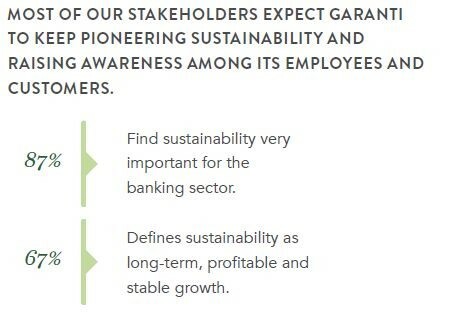 Firstly, we grouped our stakeholders according to three criteria as directly impacting Garanti, indirectly impacting Garanti and bringing in new opportunities, insights and approaches. We prioritized our stakeholders, which were grouped as customers, employees, shareholders, investors, analysts, suppliers, NGOs and associations, media, universities, financial institutions, governmental institutions and international organizations according the criteria of dependency, influence, proximity, representation, policy, strategic intent and responsibility. Based on this analysis Garanti’s key stakeholder groups are Customers, Shareholders, Employees, Investors, Government Agencies & Regulatory Bodies, and Financial Institutions. We reached most of the prioritized stakeholders via online surveys. We also interviewed our shareholders face-to-face or by telephone, held a focus group meeting with the Sustainability Representatives in the Head Office and conducted interviews with 10 senior managers directly reporting to the Board and the CEO. The stakeholders were requested to prioritize the relevant topics and share their opinions and expectations about the perception of important trends and Garanti Bank’s practices. While 14 issues have been identified as material by our stakeholders the top five issues are customer centricity, risk and crisis management, digital transformation, transparent disclosure of information for stakeholders and financial performance.